The 81st edition of the London Farm Show is only two days away! The largest indoor Farm Show in Eastern Canada, which showcases the latest in industry trends and agricultural technology, will continue to uphold its slogan ‘Come Grow With Us’ with the unveiling of the revolutionary new Case IH tractor on Wednesday, March 6th at 11:00 a.m. The new model-year 2020 AFS Connect Magnum series is a high-powered tractor that is purpose-built for digital interactivity, and wirelessly sends and receives farm, fleet, and agronomic data safely. The AFS Connect Magnum offers new levels of connectivity and comfort,” Jay Barth, marketing manager, stated. Added connectivity takes form with Remote display viewing for off-site viewing of the cab, a Remote service tool for maintenance requests, and Firmware over the air (FOTA) for wireless updates. Three new system components, AFS Pro 1200 LCD display, New AFS Vision Pro operating system, AFS Vector Pro receiver, also add to the overall enhanced experience. The redesigned cab environment and updated attractive exterior allow the new Magnum to stand out from the crowd while the additional exterior features add visibility. This will be the first time that the AFS Connect 2020 Magnum series is unveiled in Canada and is said to be the manufacturer’s largest technology launch in 10 years. The tractor will be unveiled at the Case IH booth # 727N at 11:00 am, Wednesday, March 6, 2019. PIONEER/CORTEVA: Drop by the Corteva Conversations Lounge from 10 a.m. – 2 p.m., brought to you by the experts at Corteva Agriscience™, Agriculture Division of DowDuPont and Pioneer and learn about their new Enlist E3™ soybeans, along with other topics such as corn quality management, digital agronomy, residue management, cover crops and more. HFL Fabricating: HFL Fabricating will be showcasing their new Biomass Builder row unit for side dress/ interseeding in corn, at their booth number 706N at the show. Be sure to stop by booth #706N for HFL Fabricating’s new Biomass Builder row unit for side dress/interseeding in corn. A very new product, on display at the London Farm Show. POETTINGER: Will be introducing for the first time in Ontario the Novacat 352 CF (CrossFlow), which offers swath merging without a conditioner. The NOVACAT 352 CF, PÖTTINGER now offers a cost-effective and lightweight system for merging swaths. 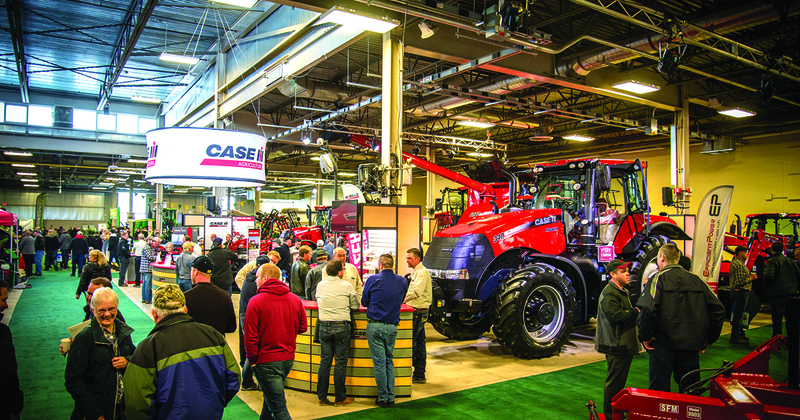 The Farm Show will also have 370+ exhibitors, along with their products and services. We are also delighted to welcome the presence of a special guest, Minister Ernie Hardeman to this year’s show. For more information on exhibitors, please visit www.londonfarmshow.com. Please send through the names of all media attending the show to media liaison Kylee Brennan by Tuesday, March 5th. Western Fair District Agriplex at 845 Florence St, London, ON. BMO Centre at 295 Rectory St, London, ON. With over 175 years in the field, Case IH is a global leader in agriculture and farm equipment. By teaming with customers, Case IH offers productivity enhancing products that include tractors; combines and harvesters; hay and forage equipment; tillage tools; planting and seeding systems; sprayers and applicators; and site-specific farming tools. In addition to agricultural equipment, Case IH also offers financial services and parts and service support for farmers and commercial operators through a network of dealers and distributors.